Gray Water Systems: Good Idea or Bad Mistake? Most of us realize that water is a scarce resource and are looking for ways to use less of it in our homes. We need water for drinking, for cooking, cleaning, flushing toilets, and -- unless we are into xeriscaping -- irrigation. We can save water by using more efficient fixtures, taking shorter showers, fixing leaks, and being more careful about how we use it. We can reuse water by capturing both rainwater, and gray water -- the stuff that goes down the drains in our bathroom sinks, showers, tubs, and washing machines. It is possible to clean and filter gray water and reuse it both inside our homes and for irrigation, but it takes effort to do it right and it comes with challenges. First, we need to distinguish gray water from black water – the waste from kitchen sinks, dishwashers, and toilets. Black water can’t be reused in our homes until it is fully treated and sanitized in a sewage treatment plant, something most of us don’t have in our back yards. Gray water is easier to prepare for reuse, commonly in indoor storage tanks designed just for this purpose. Installing a gray water system in your house requires two sets of drain lines, one for the gray water and one for the black water. All the black water goes into the sewer or septic tank, and rest goes into the gray water tank. 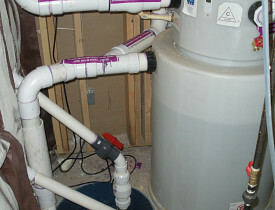 This tank, is usually in the basement or crawlspace, filters, treats and stores the gray water until it is reused. Filters take out the big yucky stuff – hair, lint, etc. Treatment is necessary to keep the water from getting toxic, and is done with chlorine, ultraviolet light, or a combination of these and other methods. Treated gray water can be used to flush toilets and to irrigate, under certain conditions. For flushing toilets, you need to have supply lines to each toilet separate from the regular water in the house – easy if you’re building a new house, more work to retrofit. Gray water is okay for underground or soaker hoses, but it shouldn’t be used to supply sprinkler heads because it can "aerosolize," or spray nasty stuff in the air ... which could make you sick if you breathe it in. If you decide to put a gray water system in your house, make sure you understand exactly how much maintenance it needs, and what chemicals or other treatment the water needs. If you’re not the kind of person who likes to take care of things, think hard before you give it a try. Filters can get clogged, pumps may break, chemicals might go out of balance – there are lots of complicated things that could go wrong with a gray water system. If you want to collect water, stick a few rain barrels on your downspouts. They are cheaper and will collect a lot of water, which you can use for irrigation and even flushing toilets if you like, without the complicated treatment gray water requires.